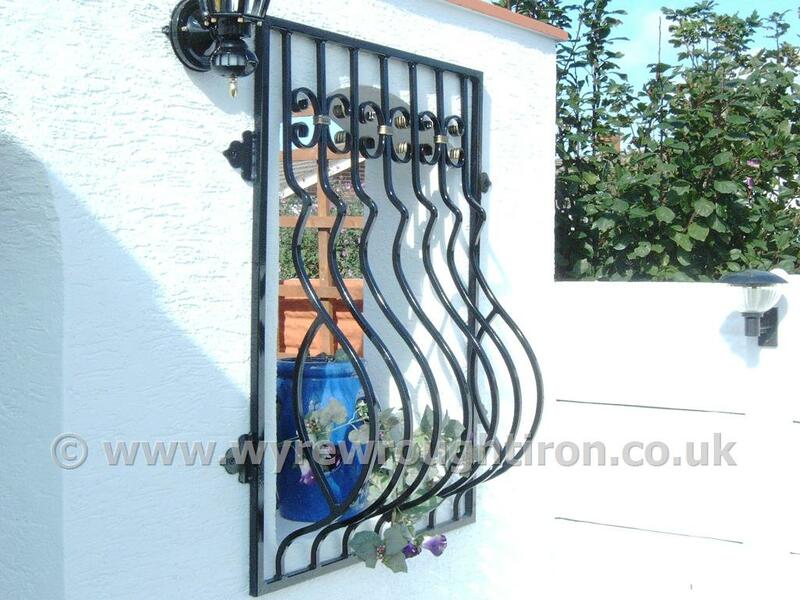 Please take a look at our Photo Gallery below for examples of our wrought iron products. If you're looking for further inspiration, please give us a call. 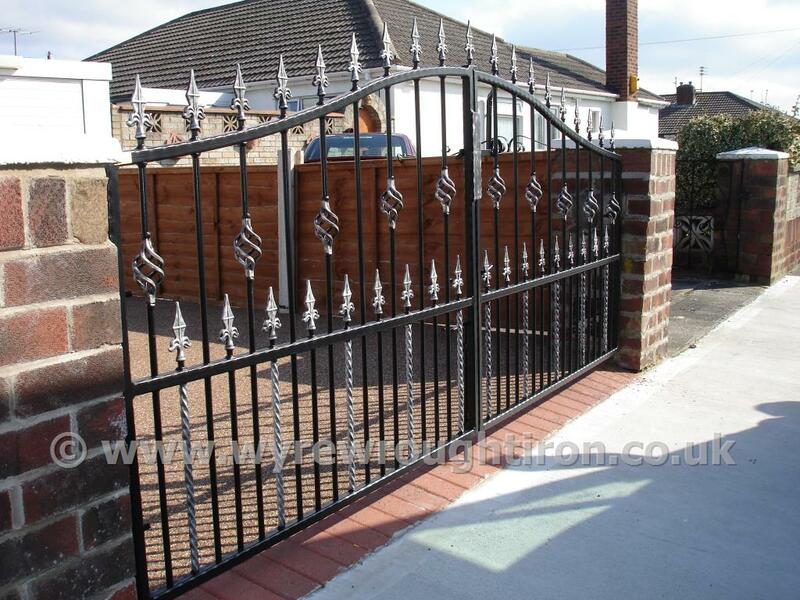 Double gates with drop arches, railheads, cage twists, barrels and scrollwork, galvanised and powder coated in black for customer in Rossall, Fleetwood. 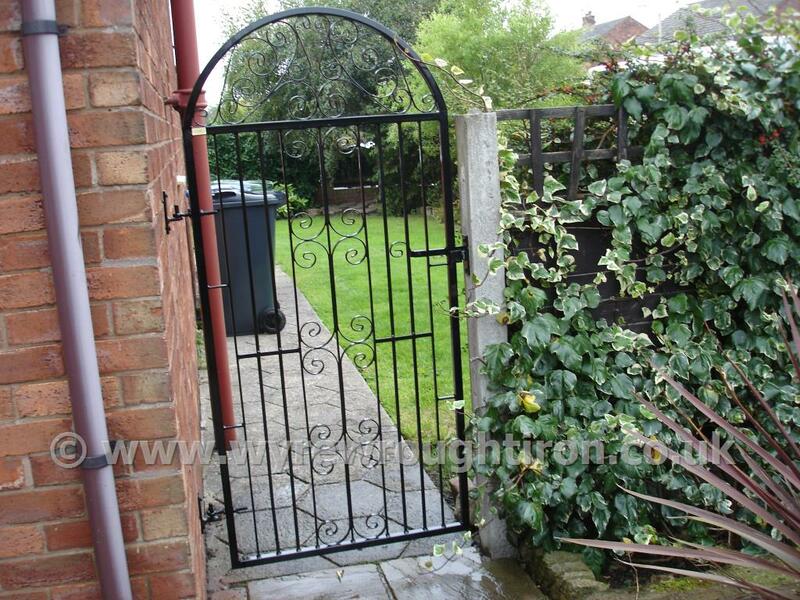 Single arch top gate, with railheads and cage twist. 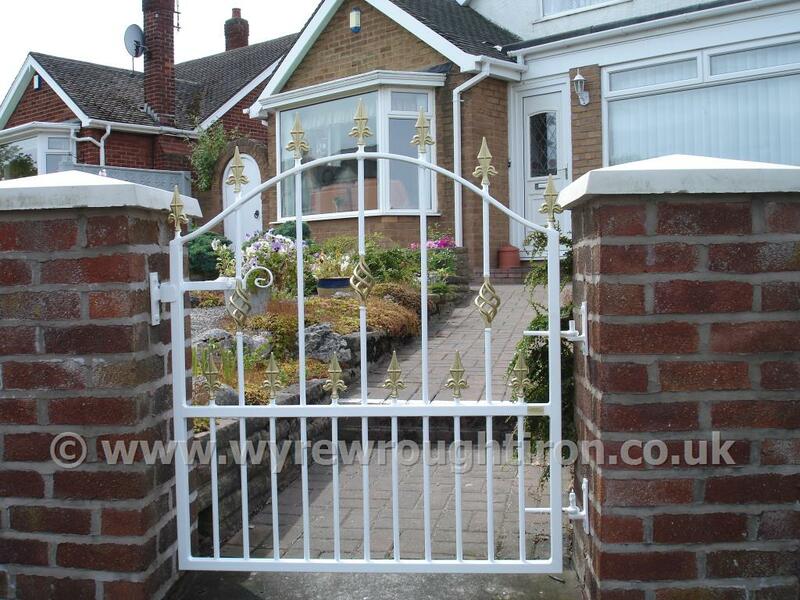 Galvanised, powder coated white and fitted in Poulton-le-Fylde. 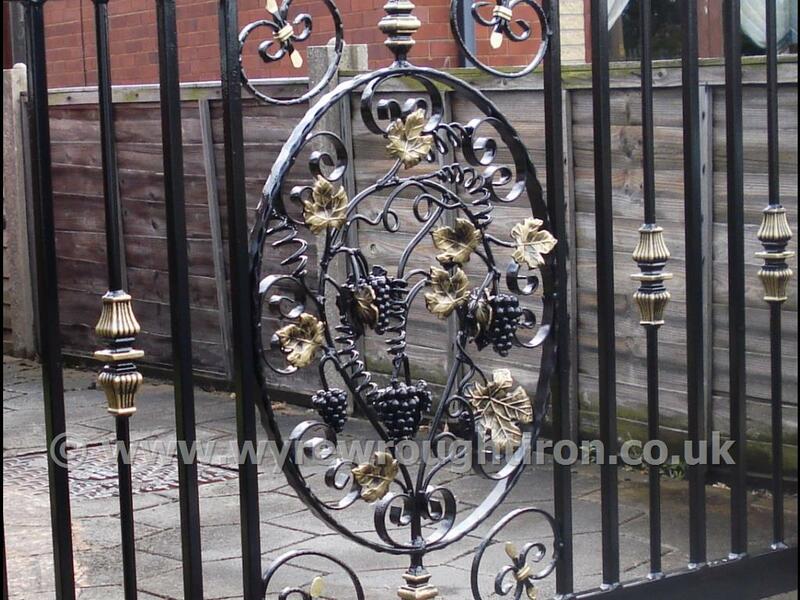 Double arch wrought iron gates with ball railheads, cage twists and hand finished roses, vines and leaf detail. Galvanised and powder coated in black for Fleetwood customer. 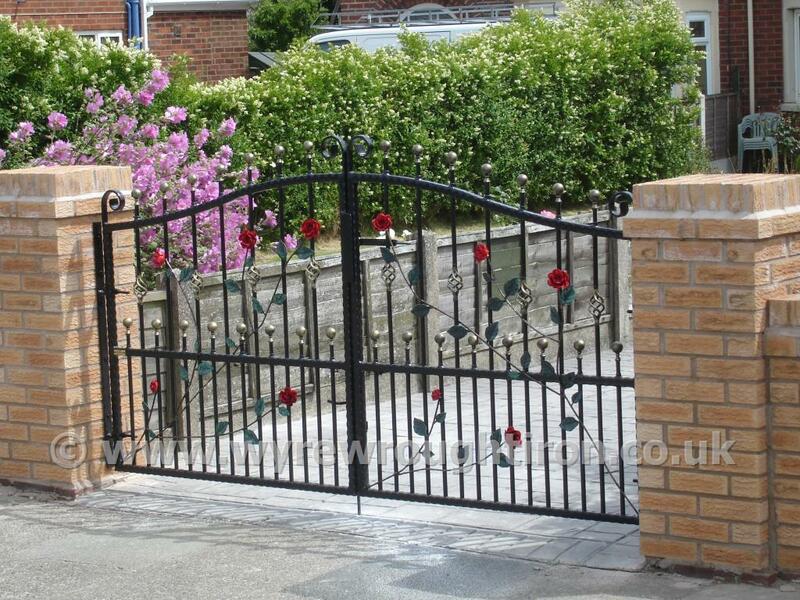 Double arch gates with railheads, cages twists and twisted bars. 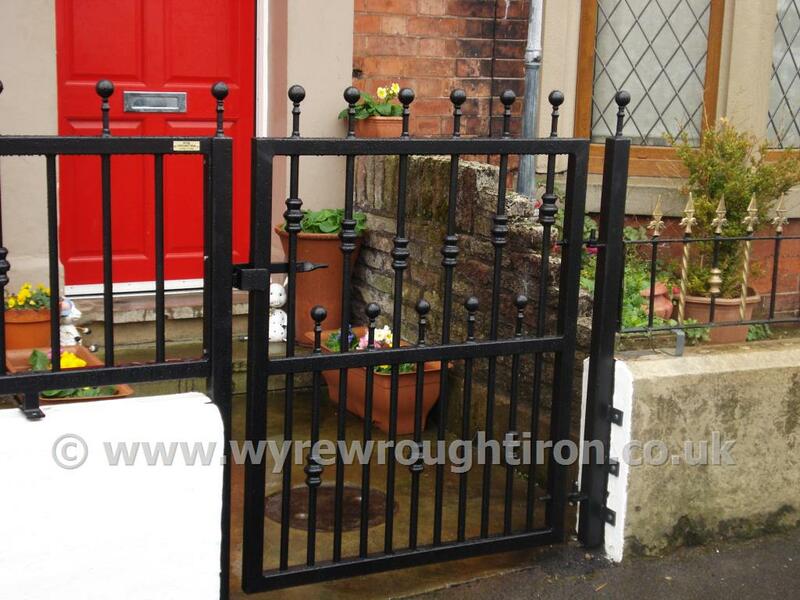 Powder coated in black and fitted to a property near Stannah, Poulton-le-Fylde. 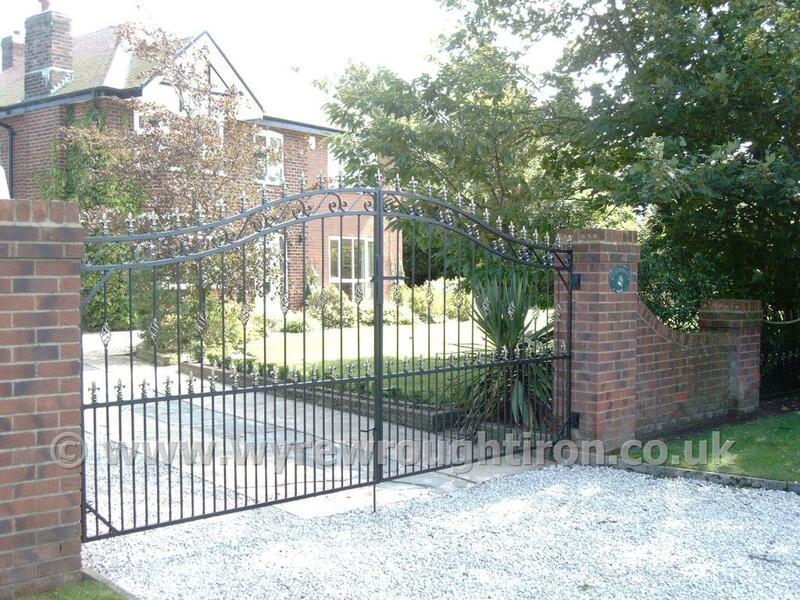 Tall double gates in Thames design with galvanised finish. Sheet backing added for security and privacy for the rear of this Poulton property. 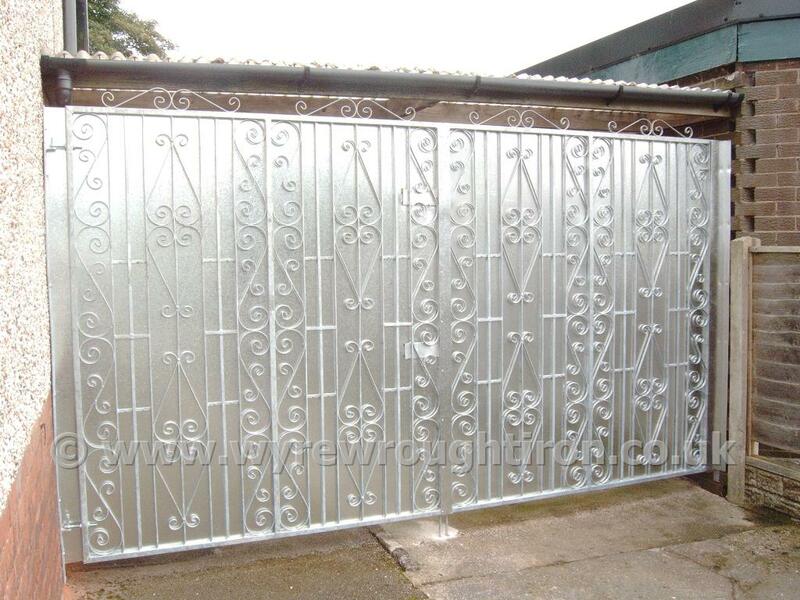 Large box section single flat top gate with ball railhesds and barrels. 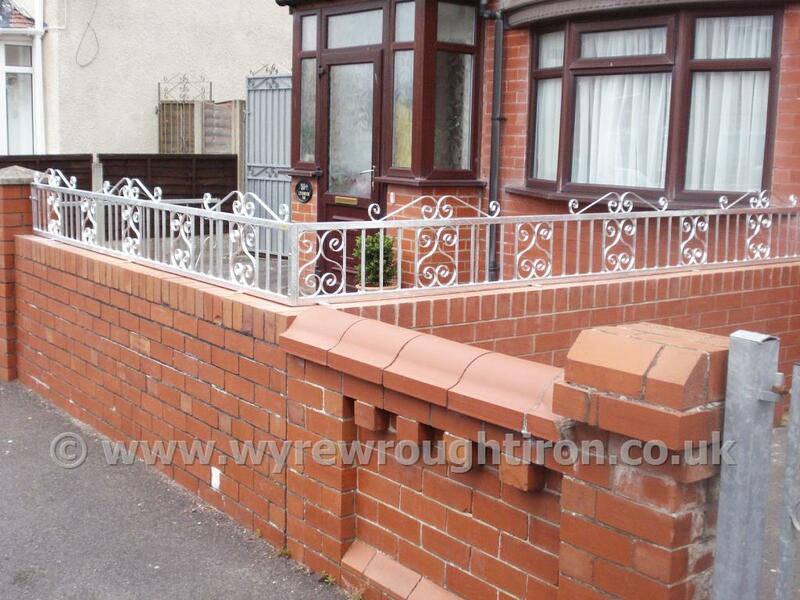 Galvanised, powder coated and fitted in Fleetwood. 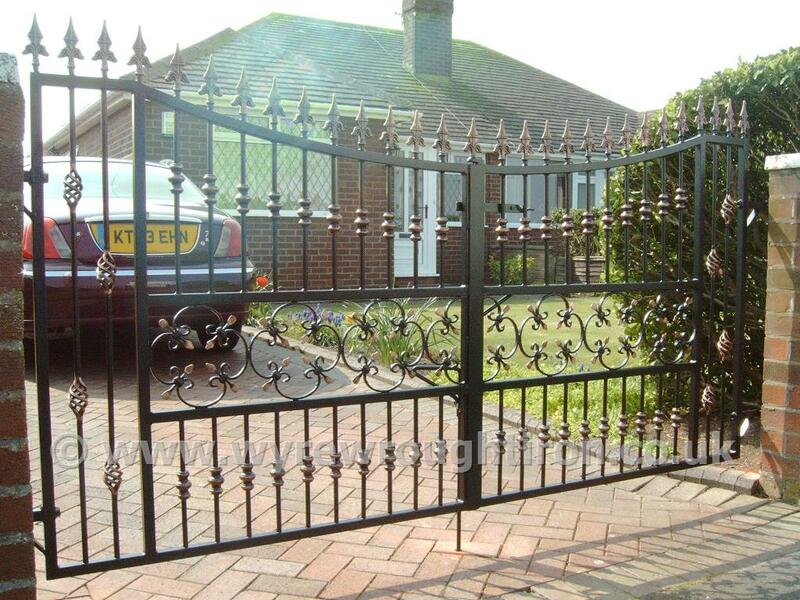 Tall double gates in Popular design with railheads and cage twists. 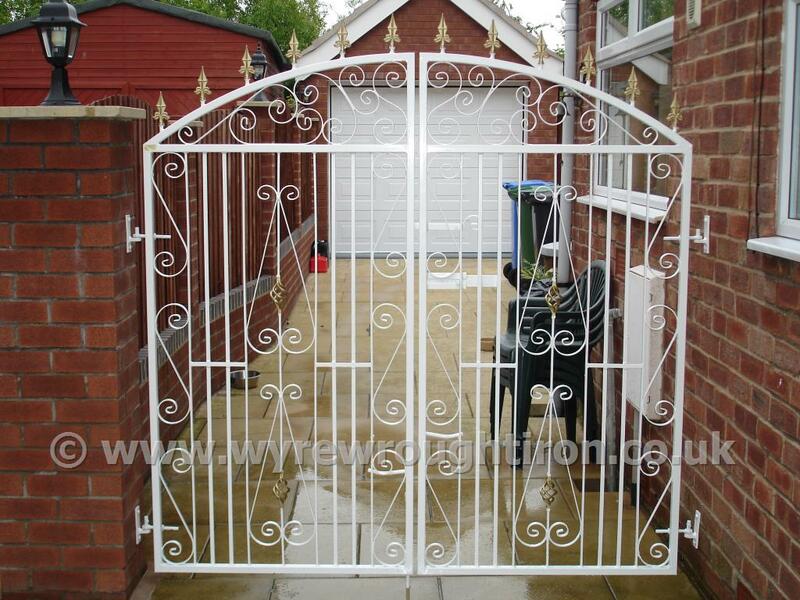 Galvanised, powder coated white and fitted to close off the rear of Thornton household. Tall single arched gate with scrollwork design, matching scrollwork frame and lockable slide bolt providing security for the rear garden. Fitted in Carleton, near Blackpool. 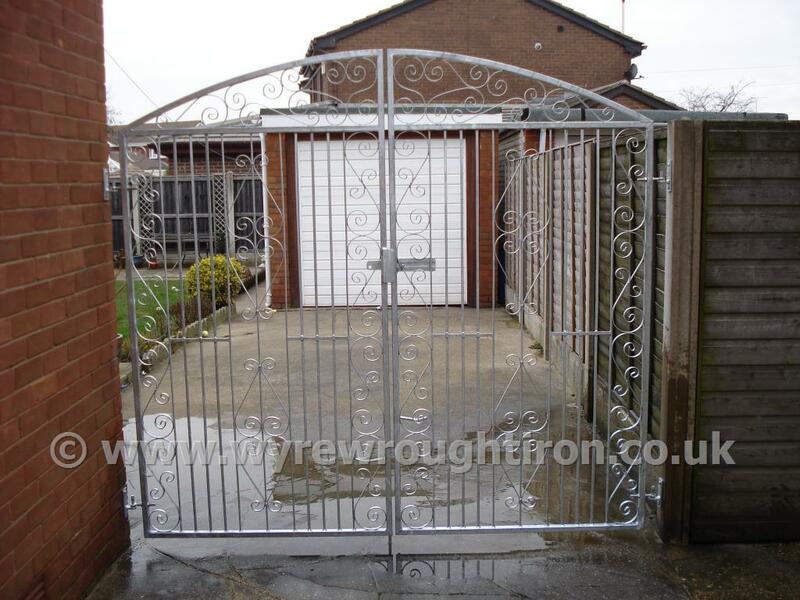 Specially commissioned design for automated gates installed to a property at Hambleton, Over Wyre. Detail of bespoke design for single driveway gate in Cleveleys, near Blackpool. Features intricate grapevine centrepiece with hand painted finishing. 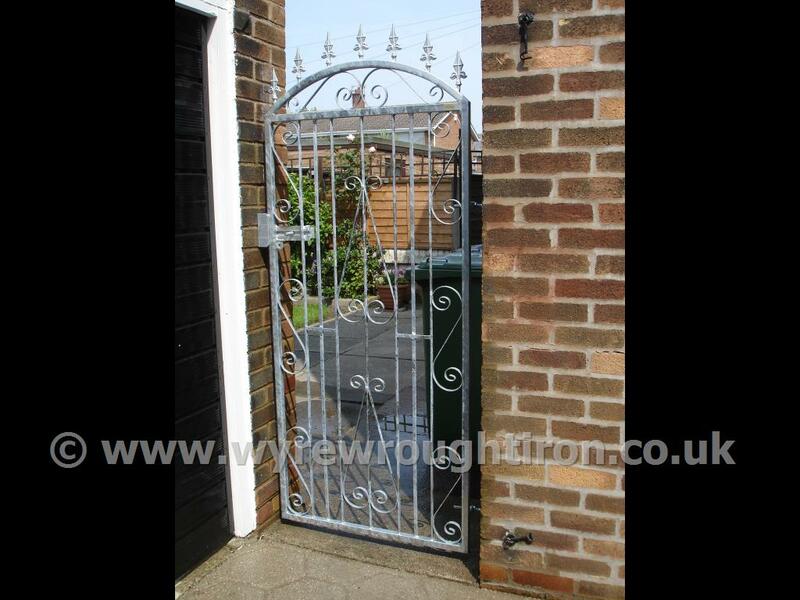 Tall single gate in galvanised finish with slide bolt for a padlock to secure this rear garden in Layton, Blackpool. Spiked finials add extra security as something uncomfortable to climb over. Tall double arched gates with railheads, scrolled tail circles, black powder coating and gold finish created for Lytham St Annes customer. 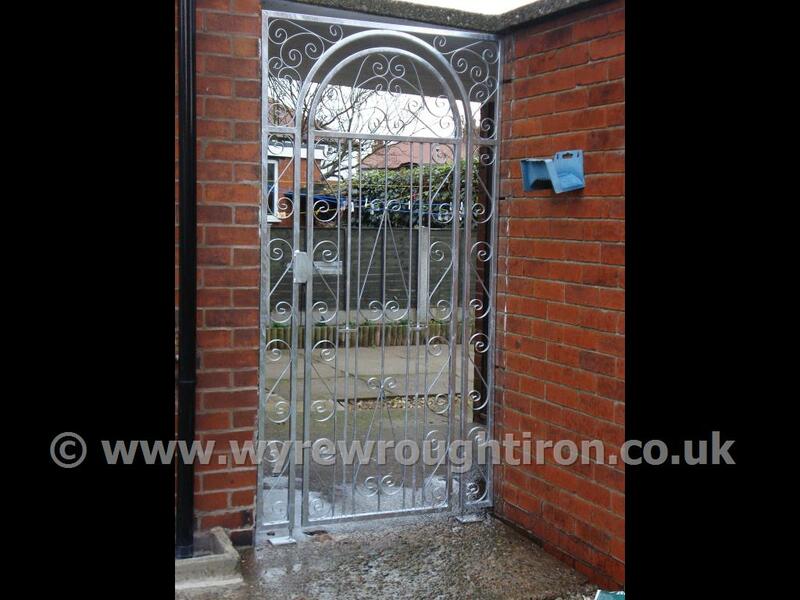 Tall double arched gates in Thames design with a galvanised finish, completed for a client in Bispham, near Blackpool. 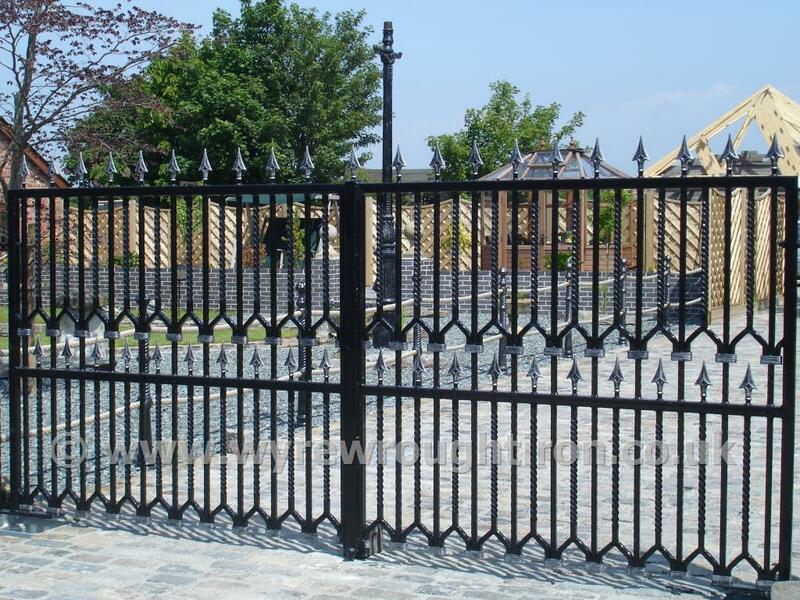 Imposing wide and tall double arched driveway gates with scrollwork, railheads, cage twists and black finish, fitted to a house in Hambleton, Over Wyre. 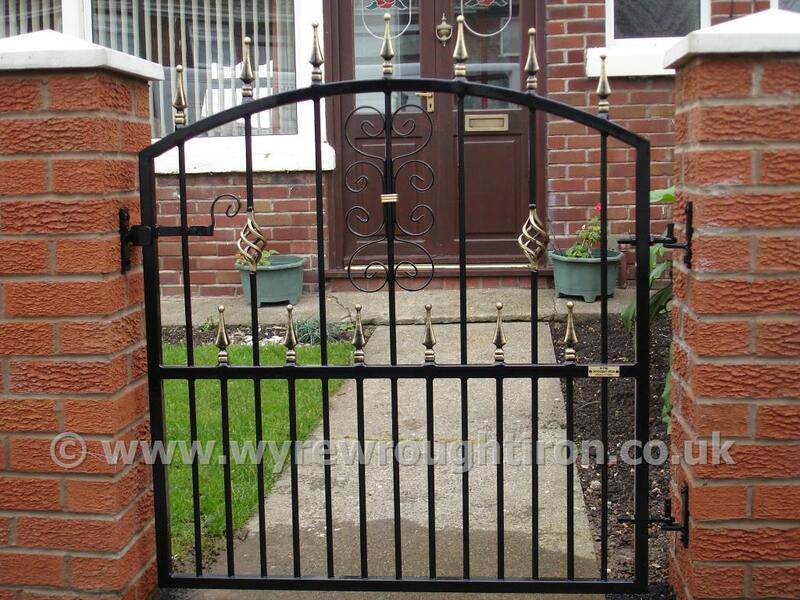 Tall single rear garden gate in C Scroll design with black powder coated finish. Completed for customer in Wrea Green, near Kirkham. 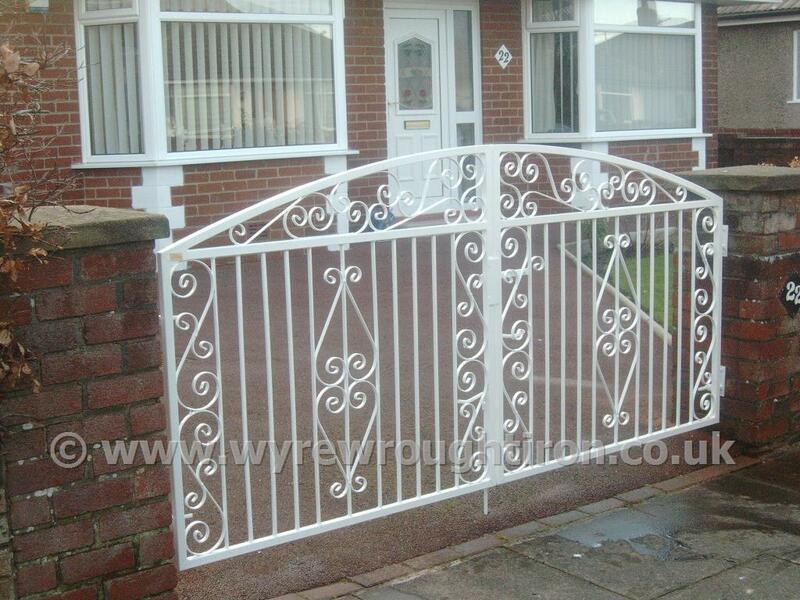 Single arch topped garden gate with railheads, cage twist and scrollwork. 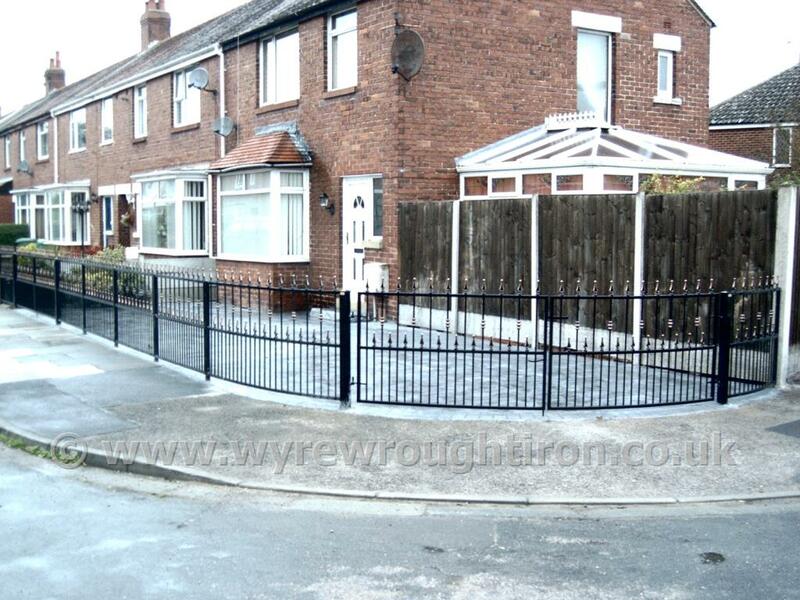 Galvanised and powder coated black for Blackpool household. 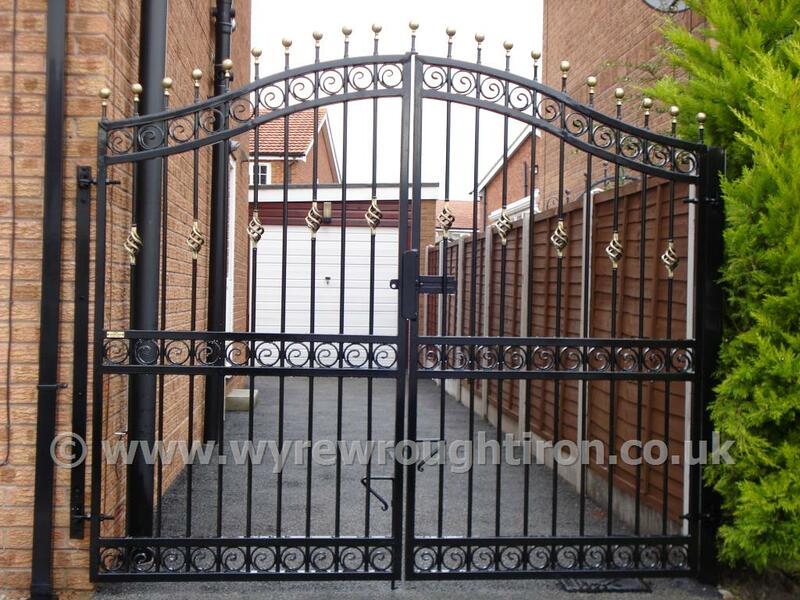 Curved gates and matching railings with flat top, railheads and barrels, black powder coated finish and gold detailing for Thornton customer. 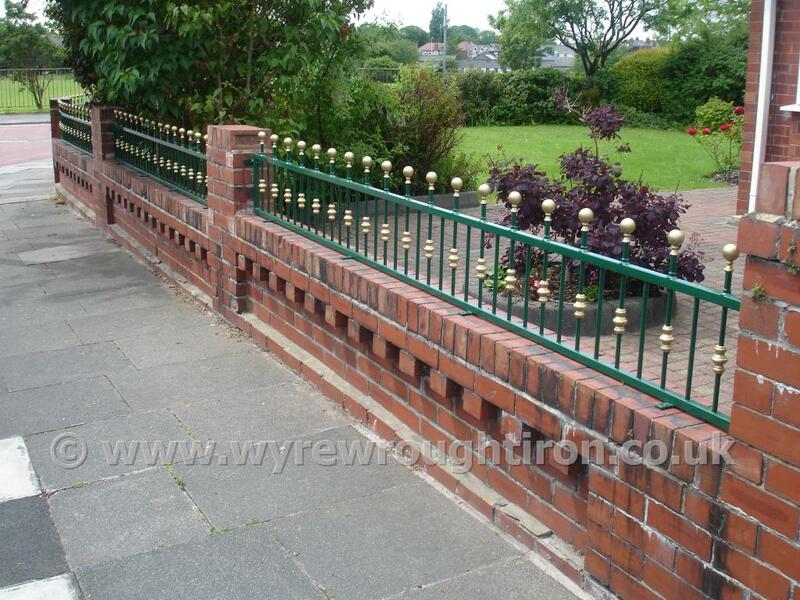 Flat top railings with ball railheads and barrels. Galvanised, powder coated in green with hand painted gold finishing for a Poulton-le-Fylde customer. 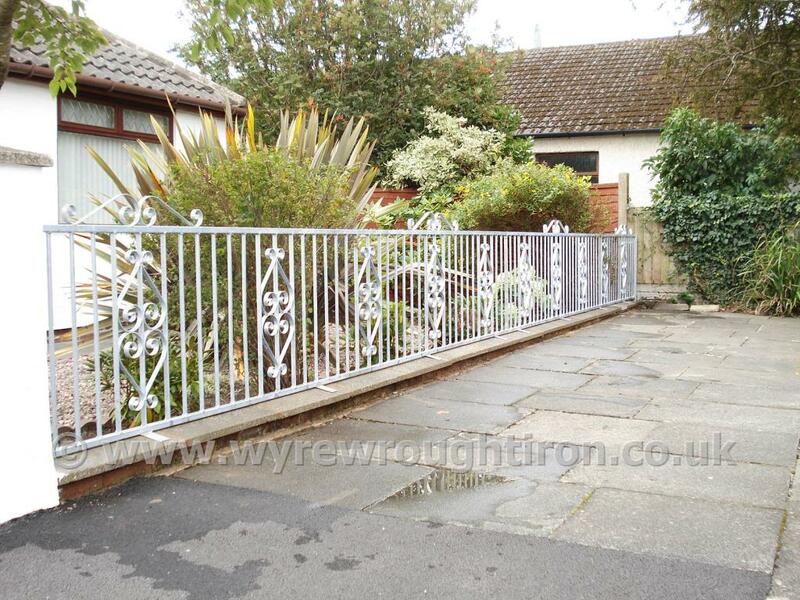 Scrollwork metal fence with galvanised finish for Thornton-Cleveleys customer. Arched top railings with ball railheads, cage twists, scrollwork and hand painted gold finishing, installed at Fleetwood property. 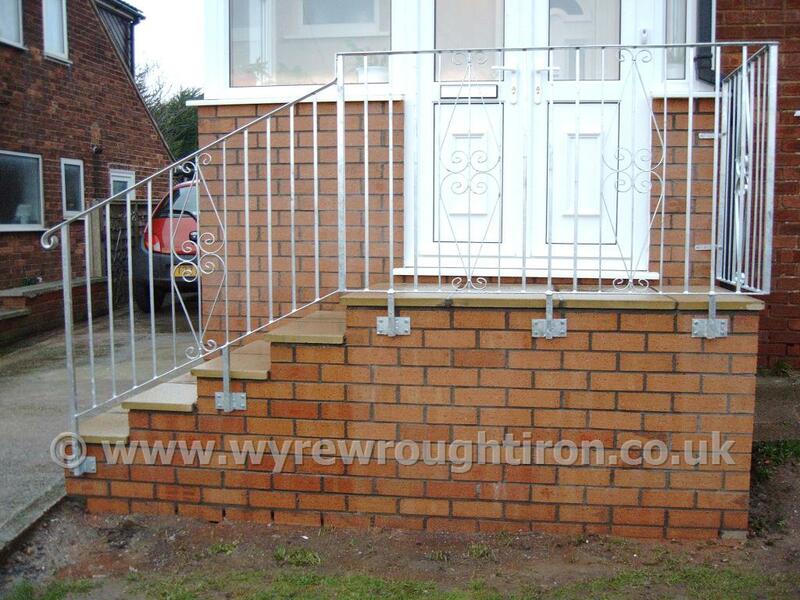 Kent design railings with top scrolls and galvanised finish, fitted at a Cleveleys household. 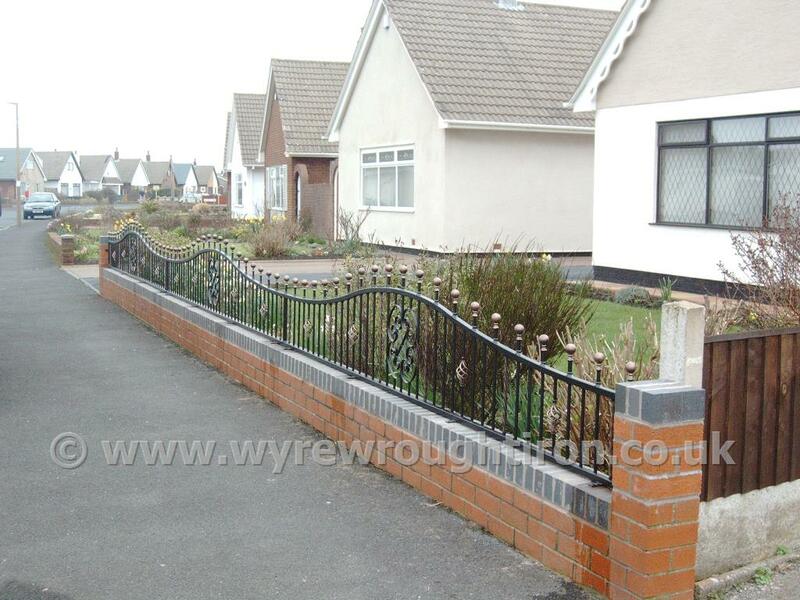 Arch garden wall railings with railhead, bush detail and galvanised finish for Fleetwood garden. Ornate handrails with twisted bar infill and cage twists. 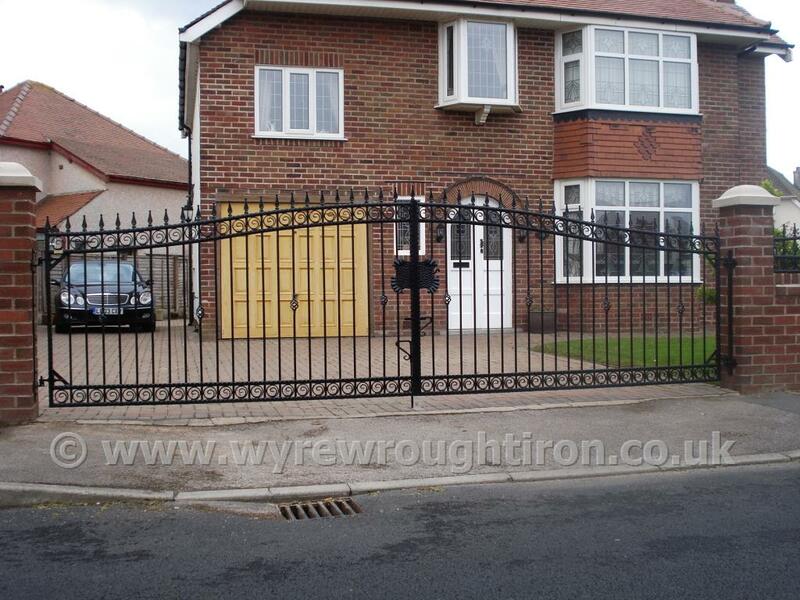 Galvanised, powder-coated in black and fitted for a customer in Normoss, Blackpool. 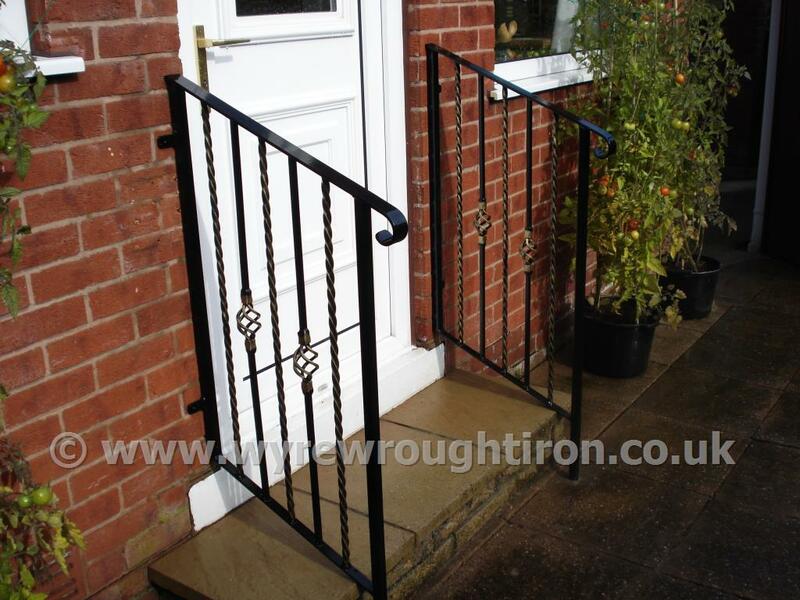 A scrolled wrought iron handrail with galvanised finish fitted to front door steps for a customer in Knott End. Handrails created for a school in Weeton, near Kirkham. 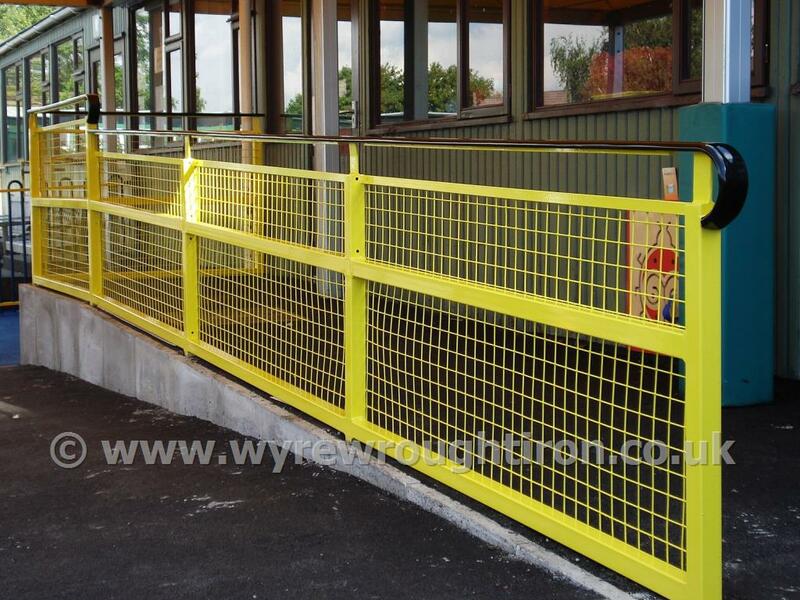 Fitted with a wire mesh infill for safety and Marley handrail capping for easy grip. Spanish style wrought iron window grille created and fitted to a property in Fleetwood. 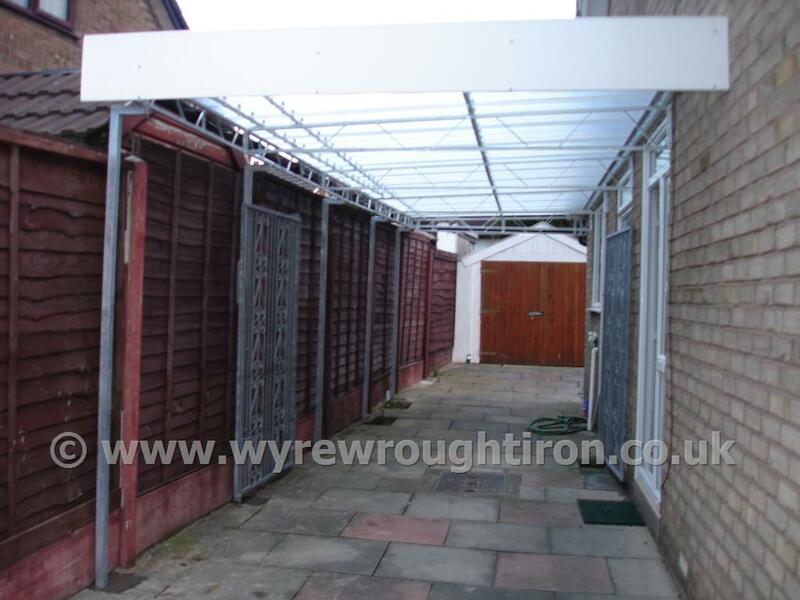 Carport in Fleetwood with space for two cars and providing sheltered access to the property. 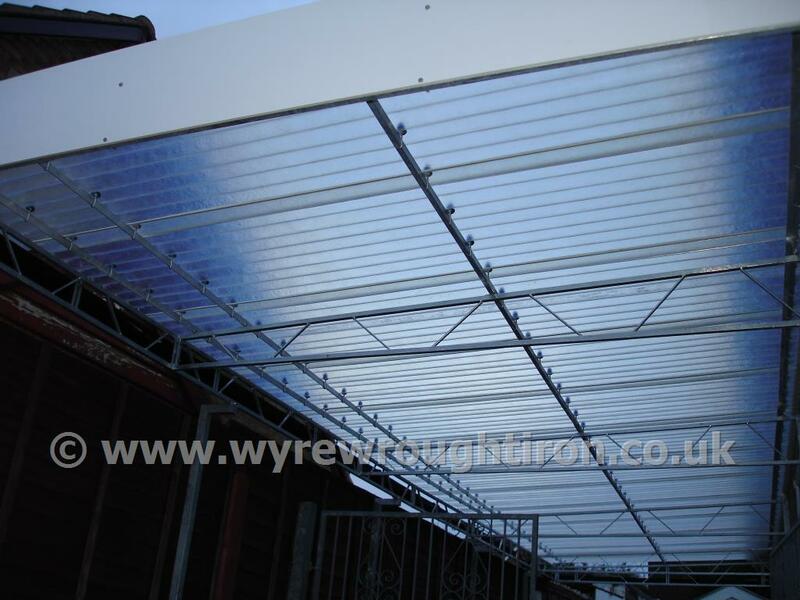 Detail of carport in Fleetwood showing steel structure and near transparent fibreglass roof. Or come and see us at Our Location in Fleetwood. 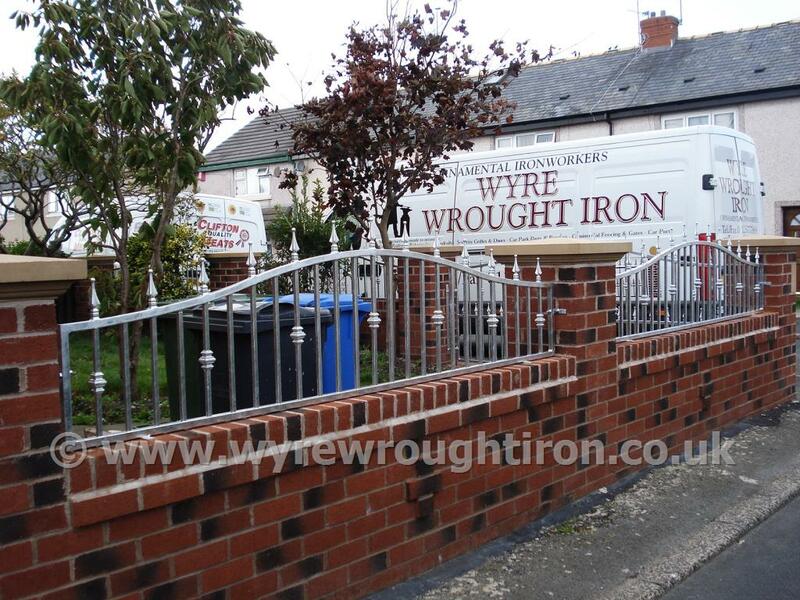 Wyre Wrought Iron are based in Fleetwood on the Fylde Coast in Lancashire and are well placed to serve local homes and businesses in Blackpool, Cleveleys, Carleton, Fleetwood, Freckleton, Garstang, Great Eccleston, Hambleton, Kirkham, Knott End, Lytham, Poulton-le-Fylde, Pilling, Preesall, St Annes, Thornton, Warton, Wesham and Wrea Green.